Brian Axel Hoyer (born October 13, 1985) is an American football quarterback for the Chicago Bears of the National Football League (NFL). He was signed by the New England Patriots as an undrafted free agent in 2009. He played college football at Michigan State. Hoyer has also played for the Pittsburgh Steelers, Arizona Cardinals, Cleveland Browns and Houston Texans. Hoyer attended Saint Ignatius High School in Cleveland, Ohio, where he played both football and baseball for the Wildcats. On the varsity baseball team, Hoyer played multiple positions: pitcher, infielder, and outfielder. In 2002, he compiled an 8–1 record with a 1.99 ERA as a sophomore. He was the winning pitcher in the 2002 Ohio Division I State Championship game allowing 2 earned runs in 6 innings pitched. In football, Hoyer compiled a 16–7 record (.696) as a two-year starter for Coach Chuck Kyle. In 2002, he completed 131 of 263 passes (.498) for 2,130 yards, 18 touchdowns and 12 interceptions. In 2003, he completed 258-of-412 passes for 5,570 yards, 45 touchdowns and 15 interceptions while leading his team to a 9–3 record. He was named USA Today Prep Player of the Week for his performance against Shaker Heights High School. Hoyer was an Associated Press Division I all-state selection as a senior. Hoyer participated in the 2004 Ohio All-Star Classic and the July 24 Ohio-Pennsylvania Big 33 All-Star Game. 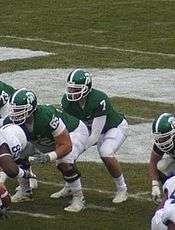 Hoyer was redshirted by Michigan State University in 2004, where he earned Scout Team Offensive Player of the Week honors twice. In 2005, he saw action in five games in which he completed 15 of 23 passes (.652) for 167 yards and two touchdowns. In a game against Illinois, he combined with Drew Stanton to throw seven touchdown passes, which tied the Big Ten single-game record. In 2006, he played in eight games and completed 82 of 144 passes for 863 yards, had four touchdowns and three interceptions. One of those touchdown passes was completed to Javon Ringer. In 2007, Hoyer was an honorable mention All-Big Ten selection. He completed 223 of 376 throws (.593) for 2,725 yards, 20 touchdowns and 11 interceptions in 13 games. He had six 200-yard passing games. In 2008, his senior year, he was listed among 26 preseason candidates for the 2008 Johnny Unitas Golden Arm Award, which is presented annually to the nation's top senior quarterback. That year, he played in 13 games and completed 180 of 353 passes (.510) for 2404 yards and 9 TDs and 9 interceptions. Hoyer was rated the ninth best quarterback in the 2009 NFL Draft by NFLDraftScout.com. Despite being invited to the NFL Scouting Combine, Hoyer was not selected in the 2009 NFL Draft. He signed immediately after the draft with the New England Patriots. Hoyer debuted in the Patriots' preseason game against the Cincinnati Bengals, completing 11 of 19 passes for 112 yards. In the preseason finale against the New York Giants, Hoyer played at quarterback the entire game, leading the team on a comeback after trailing 21–0 in the first quarter to a 38–27 win, completing 18 of 25 passes for 242 yards, one touchdown, and no interceptions. Hoyer finished the preseason 29–44 for 354 yards, including one touchdown, with a 98.1 passer rating. Of the four quarterbacks behind Tom Brady during training camp, the Patriots released Matt Gutierrez, Kevin O'Connell, and Andrew Walter, leaving Hoyer as Brady's only backup when the Patriots made their final cutdowns on September 5. He made his professional debut on October 18, in the second half of a game against the Tennessee Titans. On his first drive, he was 5/5 for 35 yards, concluding it with a 1-yard rushing touchdown, which set a franchise record for points scored in the Patriots' 59–0 win. Hoyer entered the 2010 preseason as Brady's only backup. During the preseason, Hoyer completed 32 of 57 passes for 471 yards and three touchdowns, with one interception and four sacks. He saw his first action of the regular season late in a 34–14 loss to the Cleveland Browns, throwing his first career interception. In Week 17, against the Miami Dolphins, he threw a 42-yard touchdown pass to Brandon Tate, the first touchdown throw of Hoyer's NFL career. Although the Patriots drafted quarterback Ryan Mallett in the draft over the summer, Hoyer retained his role as Brady's primary backup. In the preseason, Hoyer threw for 296 yards on 25 of 42 passes with one touchdown and no interceptions. Hoyer saw only limited action during the 2011 season; his only pass attempt was the Patriots' final attempt of the 2011 regular season. The pass, which head coach Bill Belichick asked offensive coordinator Bill O'Brien to call, was a 22-yard pass to tight end Rob Gronkowski to give Gronkowski the NFL record for receiving yards by a tight end. On August 31, 2012, during final cuts, Hoyer was released by the Patriots. He practiced with Saint Ignatius players while hoping for another team to sign him. On November 20, 2012, Hoyer signed with the Pittsburgh Steelers after injuries to starting Quarterback Ben Roethlisberger and backup Byron Leftwich within a week of each other. He served as the backup to Charlie Batch in Weeks 12 and 13 against the Cleveland Browns and Baltimore Ravens respectively. He was released on December 8, 2012. He was claimed on waivers by the Arizona Cardinals on December 10. Hoyer replaced Ryan Lindley in Week 16 against the Chicago Bears, and completed 11 of 19 passes for 105 yards and one interception. On December 26, Cardinals head coach Ken Whisenhunt announced that Hoyer would start the season finale against the San Francisco 49ers, making him the fourth quarterback for the Cardinals. On May 12, 2013, Hoyer was released by the Cardinals. On May 16, he was signed by the Cleveland Browns to a 2-year deal. On September 18, in relief of then-starter Brandon Weeden, who was out with a thumb injury, the Browns skipped over 2nd string Jason Campbell and named him the starting quarterback for the Week 3 game against the Minnesota Vikings. He threw for 321 yards with 3 touchdowns and 3 interceptions in the team's first win of the season. It was announced later in the week that Hoyer would be the Browns' starting quarterback for Week 4 against the rival Cincinnati Bengals, as Weeden remained out with a thumb injury. Hoyer led the Browns to another win, completing 25 of 38 passes for 269 yards and 2 touchdowns, along with throwing no interceptions in a 17–6 victory. The next day on September 30, Hoyer was named the starter for a third straight game, Thursday Night Football vs the Buffalo Bills. Despite being named starter for three straight games, Hoyer was not declared the official starter for the remainder of the 2013 season by Cleveland head coach Rob Chudzinski, who referred to the situation as "a week-to-week thing." He later added that, if Hoyer continued to exceed expectations, he would maintain his starting position. However, Hoyer sustained an ACL tear in the Thursday Night game versus the Buffalo Bills ending his promising season. With the Browns' releases of Weeden and Campbell to free agency, Hoyer stated that he was confident that he would be the starting quarterback for the Browns, no matter who they would draft in 2014. The Browns drafted Heisman Trophy winning quarterback Johnny Manziel 22nd overall, who was known as one of the top quarterback prospects in the 2014 NFL draft. Hoyer did not take this as too much of a shock, stating "I don't want people to think I'm sitting at home pouting." Head Coach Mike Pettine stated that Manziel would not simply be handed the job, leaving the starter position open to competition. On August 20, 2014, Hoyer was tabbed the starting quarterback for the Browns to begin the 2014 season. Through the first six weeks the Browns were 3–2, with the two heartbreaking losses coming on last-second scores, and Hoyer possessing a 7–1 TD:INT ratio. During Week 5 against the Tennessee Titans, Hoyer threw for 292 yards, 3 touchdowns, and an interception. Despite trailing 28–3, Hoyer led the Browns to 26 unanswered points, securing the win with a final score of 29–28. It was the largest comeback victory in franchise history, and the largest for a road team in NFL history. Hoyer led the Browns to a 6–3 start, the franchise's best nine game start since the team started 7–2 in the 1994 season. 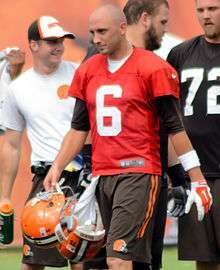 However, Hoyer struggled in the following four games, throwing only one touchdown while being intercepted eight times. As a result, the Browns lost 3 of those 4 games to fall to 7–6 on the season, jeopardizing their playoff hopes. In a Week 14 home loss to the Colts, Hoyer was 14/31 for 140 yards, 0 touchdowns, and 2 interceptions. He was repeatedly booed by fans throughout the game, and was heavily criticized for his performance following the loss. Through 13 games on the season, Hoyer had 11 touchdowns to 12 interceptions. Hoyer's struggles in this 1–3 stretch led many fans, pundits, and analysts to call for the quarterback to be benched in favor of rookie Johnny Manziel. On December 9, 2014, the Browns announced that Johnny Manziel would start in Week 15 against the Bengals in place of Hoyer. Manziel was injured in the 2nd quarter of the Browns' matchup against the Panthers, and Hoyer entered the game. He threw one touchdown and one interception while going 7/13 with 153 passing yards. In the fourth quarter, he threw an 81-yard touchdown pass to Jordan Cameron to put the Browns up 13–10. However, the Panthers regained the lead on the next drive and went on to win the game 17–13. After the season, Hoyer's contract expired and he became a free agent. On March 11, 2015, Hoyer signed a two-year, $10.5 million contract with the Houston Texans. On August 24, he was named the starter for the regular season over former Patriots teammate Ryan Mallett. In the first game of the 2015 season, with Houston trailing the Kansas City Chiefs 27–9, Hoyer was benched in the fourth quarter in favor of Mallett. On September 17, head coach Bill O'Brien announced that Hoyer would be benched in favor of Mallett for the second game of the season against the Carolina Panthers. In week 5 during a matchup against the Indianapolis Colts, Mallett was injured and was replaced by Hoyer for the remainder of the game. Hoyer threw for 2 touchdowns but also threw a costly interception to give the Colts a 27–20 victory. Hoyer was then announced as the starter for the next game against the Jacksonville Jaguars by Bill O'Brien. Hoyer led the Texans to a 31–20 victory over the Jaguars and was announced by O'Brien as the starter going forward. On January 3, 2016, Hoyer led the Texans to their first playoff berth and AFC South title since 2012 with a 30–6 victory over the Jacksonville Jaguars. The Texans played in the first AFC wildcard game against the Kansas City Chiefs, where Hoyer struggled, throwing for 136 passing yards and 4 interceptions. The Texans were shut out by the Chiefs 30–0. Hoyer was released by the Texans on April 17, 2016. On April 30, 2016, Hoyer agreed to a one-year, $2 million contract with the Chicago Bears. After an injury to starting quarterback Jay Cutler in Week 2, Hoyer started the Week 3 game against the Dallas Cowboys and threw for 317 yards and two touchdowns in a 31–17 loss. The following week, Hoyer threw two touchdowns for 302 yards in a 17–14 victory over the Detroit Lions. A week later in a 29–23 loss to the Colts, he threw for a career-high 397 yards, the most by a Bears quarterback since Jim Miller threw for 422 yards in 1999 and the fifth-most in Bears history. Hoyer also joined Josh McCown as the only Bears quarterbacks to throw for at least 300 yards in three straight games and later became the first to do so in four consecutive games after throwing for 302 yards in a loss to the Jacksonville Jaguars. Hoyer broke his left arm during the second quarter of a game against the Green Bay Packers on October 20, 2016. He was placed on injured reserve on October 24, 2016 after having surgery on his left arm, and was reported to be out at least eight weeks. Hoyer is married to his high school sweetheart Lauren Scrivens. They have one son, Garrett, and one daughter, Cameron. ↑ "NFL #7 Brian Hoyer – ESPN". Retrieved 21 December 2015. 1 2 3 "Brian Hoyer Profile – Michigan State Official Athletic Site". msuspartans.com. Michigan State University. Retrieved 4 October 2013. ↑ "NCAA career statistics (Search Hoyer, Brian)". NCAA.com. Retrieved 4 October 2013. 1 2 "Brian Hoyer". nfldraftscout.com. Retrieved August 29, 2016. ↑ Reiss, Mike (January 1, 2012). "Belichick wanted to give Gronk chance". ESPN. Retrieved December 28, 2012. ↑ Pepin, Matt (August 31, 2012). "Patriots cuts finalized: Hoyer, Branch, Koppen released". Boston. Retrieved December 28, 2012. 1 2 Valerian, Susan (2013-10-02). "Born, Raised and Starting at Quarterback in Cleveland". The New York Times. Retrieved 2 October 2013. ↑ Sessler, Marc (November 20, 2012). "Brian Hoyer signs with Pittsburgh Steelers". Around the League. NFL.com. Retrieved December 28, 2012. ↑ McManaman, Bob (2012-12-23). "Bears 28, Cardinals 13". Yahoo! Sports. Retrieved 2012-12-23. ↑ Sessler, Marc (December 26, 2012). "Brian Hoyer will be Arizona Cardinals' QB in finale". Around the League. NFL.com. Retrieved December 26, 2012. ↑ Rosenthal, Gregg (May 13, 2013). "Brian Hoyer released by Arizona Cardinals". Around the League. NFL.com. Retrieved 2013-09-29. ↑ Rosenthal, Gregg (May 16, 2013). "Brian Hoyer, Cleveland Browns agree to 2-year deal". NFL.com. ↑ Rosenthal, Gregg (October 4, 2013). "Brian Hoyer tears ACL, out for rest of Browns' season". National Football League. Retrieved October 4, 2013. ↑ "Coach: Brian Hoyer looks like starter". ABC News. May 8, 2014. Retrieved May 11, 2014. ↑ Sessler, Marc (May 9, 2014). "Browns' Brian Hoyer: I'm not 'sitting at home pouting". NFL.com. Retrieved May 11, 2014. ↑ "Brian Hoyer named starter over Johnny Manziel for Cleveland Browns opener in Pittsburgh". www.cleveland.com. Retrieved 20 August 2014. ↑ Cabot, Mary Kay (October 5, 2014). "Brian Hoyer orchestrates a Music City miracle in Cleveland Browns' 29–28 come-from-behind victory over Tennessee Titans". Cleveland. Retrieved October 9, 2014. ↑ Glazer, Jay (December 9, 2014). "Glazer: Browns name Johnny Manziel starting quarterback". foxsports.com. Retrieved December 9, 2014. ↑ Hanzus, Dan (March 11, 2015). "Brian Hoyer, Texans reach agreement on two-year deal". NFL.com. Retrieved March 11, 2015. ↑ "Texans sign QB Brian Hoyer". HoustonTexans.com. March 11, 2015. Retrieved March 12, 2015. ↑ "Brian Hoyer named starter for Texans vs. Jaguars". NFL.com. Retrieved 21 December 2015. ↑ Sessler, Marc (January 9, 2016). "Brian Hoyer sinks Texans in 30-0 loss to Chiefs". NFL.com. Retrieved January 9, 2016. ↑ Thomas, Jeanna (April 17, 2016). "Texans release Brian Hoyer a month after adding Brock Osweiler". SB Nation. Retrieved April 17, 2016. ↑ Rosenthal, Gregg (April 30, 2016). "Brian Hoyer signing one-year deal with Bears". nfl.com. Retrieved April 30, 2016. ↑ Campbell, Rich (October 2, 2016). "Bears, Brian Hoyer keep Lions defense guessing". Chicago Tribune. Retrieved October 3, 2016. ↑ Mayer, Larry (October 9, 2016). "Bears fall to 1-4 with loss to Colts". Chicago Bears. ↑ Mayer, Larry (October 16, 2016). "Bears struggle late, fall to Jaguars". Chicago Bears. Retrieved October 17, 2016. ↑ "Bears QB Brian Hoyer breaks left arm in loss to Packers". nfl.com. Retrieved October 20, 2016. Wikimedia Commons has media related to Brian Hoyer.